Search Engine Optimization (SEO) is the process of affecting the visibility of a website or web page in a search engine’s natural results. Basically, SEO affects how high up on the page a website shows up in search results. Higher rankings = more website traffic. This means that improved SEO will increase the likelihood your website will appear high up in a search engine results page (SERP), and thus increase your traffic. 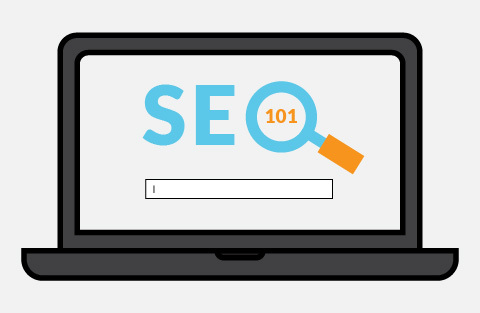 Improving your SEO takes a bit of work, but it may be even easier than you think. When you search for something in Google, you’ll receive a search engine results page showing sites that Google thinks is relevant to what you’re trying to find. In addition to each site’s content, Google will consider such factors as where you are located geographically and your past search history. At the top of your SERP, you may see paid ads, where advertisers have paid Google to list their site first for certain search terms. Organic search results are considered more credible than paid advertisements. When Google finds your site on its own rather than because it was paid to put your site first, this is a clear indicator that your website contains quality content. Organic search results receive almost 20% more clicks than paid advertisements. Sophisticated searchers avoid ads and skip to the organic results. Quality SEO has the opportunity to greatly increase traffic over time, whereas advertisements only run for as long as you’re willing to pay for them. As of 2018, over 92% of all people prefer Google to any other search engine. So this section pertains to increasing SEO on Google, the most popular search engine around the world. While there are many variables to work with when trying to increase a website’s SEO, the most important rule is to not try and trick Google’s algorithm into placing a website higher, as this will only penalize a website’s ranking. While that may seem obvious, it is a rule Google emphasizes loudly in their guidelines. Common gimmicks to avoid include “keyword stuffing,” which is exactly what it sounds like. Ensure your website is mobile friendly. Fewer people will use your website if it looks terrible on a mobile phone, and less traffic signals to Google that your site isn’t as useful. But more importantly, Google actively prioritizes mobile friendly websites because its goal is to give users quality information that’s easy for viewers to access. Optimize your website loading speed. Slow website loading speeds can deter potential users and lowers ranking from Google. One way to test site speed and receive explicit suggestions on how to improve speed is on Google’s PageSpeed Insights. Remove all broken links on a website. Broken links are webpage links that do not work due to deleted pages or website structure changes. This shows Google that the website is being monitored and maintained when changes are implemented. Avoid having too many links on a single webpage. Too many links make Google think you’re peddling spam and will hurt your ranking. Avoid duplicate content. Duplicate content is large blocks of content on your website that are repeated in more than one place, which can look manipulative to Google. Minimize such content by consolidating similar pages, or rewriting one block of content so that the message is still conveyed but the words are not exactly the same. Site navigation should be clear. When Google “crawls” your site, it creates an index of the content that is used whenever someone performs a search. It’s like a giant reference book of the entire internet. To help Google crawl the site, your navigation should feature a naturally flowing hierarchy, going from general information to more specific information. All pages should be reachable through links, all of which should feature words in the URLs rather than numbers. Each page should clearly indicate to the user where they are in the site structure. Your website’s content is extremely important to SEO, too. Google “crawls” your site to index what’s there, and the content it finds has a lot to do with how high it ranks your site. Keywords play an important role in reeling in users. There are many tools available online to see what keywords are being searched and their volume. Use these tools to create usable keywords to insert throughout the website’s pages in order to attract users who could benefit from your page. Keywords should be based on relevancy to the website content, not overall popularity of the keywords. High-quality, relevant information will retain more users and rank higher on Google search than websites utilizing popular keywords just for the initial engagement. If a keyword draws users to the site, but they bounce back because the website did not contain useful information, Google will penalize the webpage ranking in search results. Check your site for grammar and spelling. If your site contains many errors, it’s a sign to Google that the content is bad, and it will rank your site accordingly. Show Google that the website offers quality information and is a trustworthy source for users. Google prioritizes websites that are updated frequently with new content. So it’s important to post blogs or articles frequently and consistently, which will rank a website higher in results — this is an important strategy for content marketing. At the same time, the articles provide more information for Google to index, helping to drive more traffic to the website. Win-win! Generally speaking, the most important factor in SEO is making sure your website is developed and written with the user in mind — not the search engine. If you do a good job with that, your SEO will largely take care of itself. You can also run your site through the Google Search Console for more insights. By Jacob Law. Read about Jacob on our Meet Our Staff page.